Happy birthday, Barbara Emberley (Drummer Hoff). It’s the birth date of Ben Lucien Burman (1896–1984), Catfish Bend series. It’s Poinsettia Day. Read The Miracle of the First Poinsettia by Joanne Oppenheim, illustrated by Fabian Negrin, The Legend of the Poinsettia by Tomie dePaolo, and Poinsettia & Her Family by Felicia Bond. Today on the Almanac, I send birthday greetings to Sir Quentin Blake, born outside of London. While still a teenager, he began contributing to Punch magazine. After studying English at Cambridge, he took life-drawing classes at the Chelsea Art School and, in 1960, began a glorious career as a children’s book illustrator—one that has resulted in hundreds of delightful titles. In the United States, Quentin Blake is best known for illustrating the novels of Roald Dahl. It is virtually impossible to imagine the Dahl cannon without the characters visually created by Quentin Blake. After all, he showed us what the BFG looks like! He also worked with many other superb writers—Russell Hoban, Joan Aiken, and Michael Rosen—to create equally memorable work. 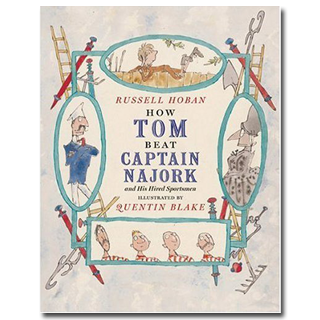 On the Almanac today, I’d like to celebrate the first Quentin Blake book to catch my eye, Russell Hoban’s whimsical picture book How Tom Beat Captain Najork and His Team of Hired Sportsmen, which appeared in 1974 and has been reprinted by David Godine. I was a young assistant editor at the Horn Book when this gem came across my desk. Relying on freewheeling nonsense, Hoban tells the story of a boy who never stops fooling around: “He did low and muddy fooling around and he did high and wobbly fooling around.” Finally, Aunt Fidget Wonkham-Strong summons her friend Captain Najork to teach Tom a lesson, although things do not go as she expects. The whimsical quality of Blake’s artwork, rendered in pen and ink with a watercolor overlay, and the characters’ facial expressions and postures make the text come to life. 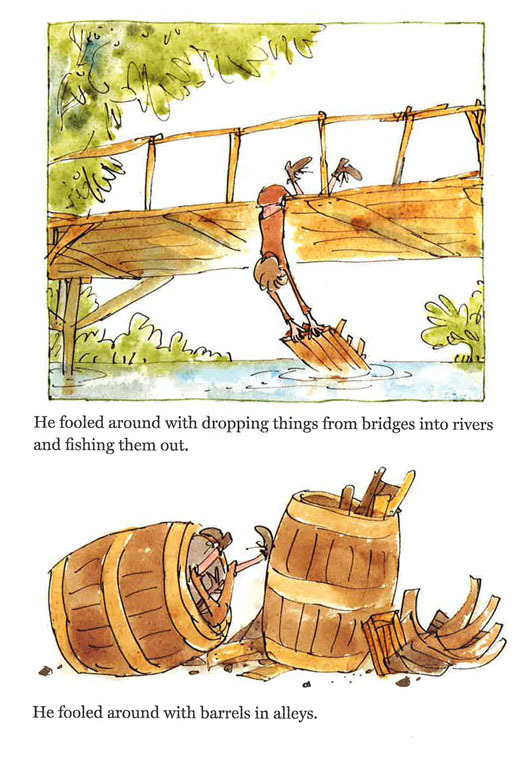 In How Tom Beat Captain Najork, as in all his books, Quentin Blake manages to make his artwork appear as if he had just scribbled it down over breakfast. He delivers images that are both spontaneous and exciting. Winner of the Hans Christian Andersen Award, in 2013 Quentin Blake received a knighthood for “services to illustration,” which include years of teaching at the Royal College of Art. But although he has been given almost every appropriate award—except a Nobel Peace Prize—what Quentin Blake has truly won over the years has been the hearts and the devotion of young readers. He has made them laugh, look again at his drawings, and enter into the world he visually creates. And so, taking our cue from the BFG, today we raise a “frobscottle” in his honor. Originally posted December 16, 2013. Updated for . I of course read BFG (thanks to Anita) so that name perked my attention up. I tried book stores locally and the library. The library has a ton of books illustrated by Blake, unhappily, not this one. I shall go forth into the world and locate a copy. Oh boy, oh boy! Can’t wait. Gordon: I’m always happy to bring you a book you don’t know. A bookstore should be able to order this — I know it is in print because of getting copies for this Almanac post. I am such a fan of Quentin Blake – I will have to track down this one as well. Thanks for the recommendation! This is one of the great children’s books of all time. I am glad it was reissued. I own a copy that some librarian foolishly discarded when it was o/p! Lucky me. Such wonderful language, such glorious art. Thank you, Anita, and thank you, Quentin Blake. One of my all time favorite books. Makes me want to go draw something. Here’s to many happy hours reading about Tom et al with my son Robb who, as a mechanical engineer, is still “fooling around”. Partial credit goes to Quentin. I can’t wait to introduce his daughter and my granddaughter Emma to all those lovely shenanigans.